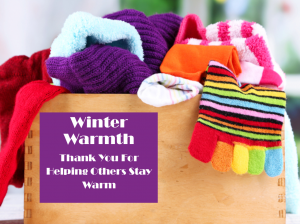 The DAAR Community Service Committee is conducting a Winter Warmth program benefiting LAWS, Mobile Hope and the Loudoun Emergency Homeless Shelter. Over the past year, Loudoun County homelessness has increased 18.5 percent. * As the weather grows colder, many, including children, will need warm clothing and bedding for the winter. We are collecting gently worn and clean coats, scarves & gloves, in all sizes, in addition to twin sheets, blankets, towels and pillow cases for the shelters. Donations can be dropped off at DAAR, 21720 Red Rum Drive, #177, Ashburn, VA from September 1—November 9 or at the DAAR REALTOR® Recharge on October 25th from 8AM-4PM at the Holiday Inn Washington Dulles, 45425 Holiday Drive, Sterling, VA 20166. Please contact Beth Fischel, Member Services Manager, at bfischel@dullesarea.com or 703-777-2468 if you have any questions.